Shivaji Bhosle with the royal title Chhatrapati Shivaji Maharaj was a Maratha king from the Bhosle dynasty who founded the Maratha empire. Shivaji led a resistance to free the Maratha nation from Sultanate of Bijapur, and establish self rule ("Hindavi Swarajya"). He created an independent Maratha kingdom with Raigad Fort as its capital and fought against the Mughals to defend his kingdom successfully. He was crowned as Chhatrapati - the Soveriegn- of the Maratha Kingdom in 1674. He achieved the re-establishment of Maratha rule on their homeland after being ruled and dominated by various Muslim dynasties for few hundred years. He established a competent and progressive civil rule with the help of well regulated and disciplined military and well structured administrative organizations. The prevalent practices of treating women as spoils of war, destruction of religious monuments, slavery and forceful religious conversions were firmly opposed under his administration. Shivaji was a religious Hindu, and showed respect for all other religions. He also innovated rules of military engagement of that era. He pioneered "Shiva Sutra" or Ganimi Kava (guerrilla tactics), which leveraged strategic factors like demographics, speed, surprise and focused attack to defeat his bigger and more powerful enemies. Shivaji Maharaj was an able administrator who established a government that included modern concepts such as cabinet (Ashtapradhan mandal), foreign affairs (Dabir) and internal intelligence. 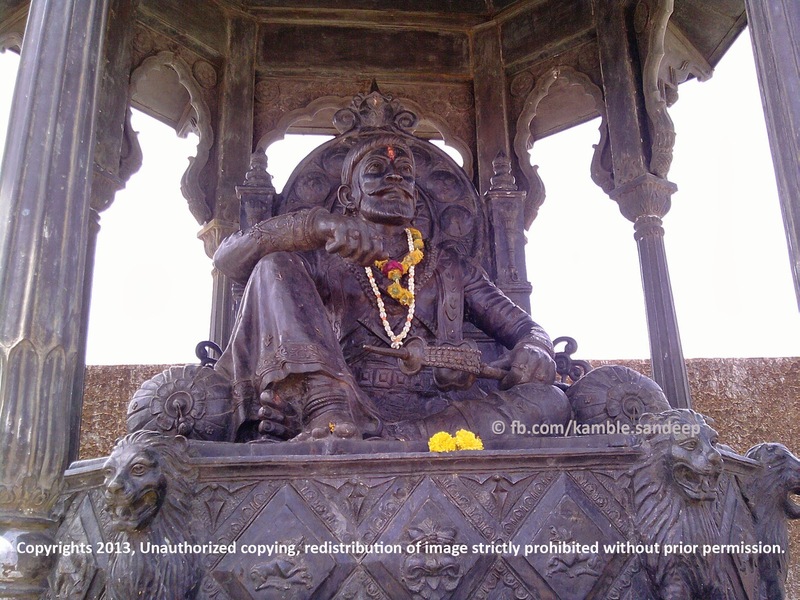 Shivaji established an effective civil and military administration. He also built a powerful navy and erected new forts like Sindhudurg and strengthened old ones like Vijaydurg on the west coast. The Maratha navy held its own against the British, Portuguese and Dutch. During his long military career and various campaigns his strong religious and warrior code of ethics, exemplary character and deep seated and uncompromising spiritual values directed him to offer protection to houses of worship, non-combatants, women and children. He always showed respect, defended and protected places of worship of all denominations and religions, in th true sense of the term 'Rajyogi'. Shivaji captured strategically important forts at Murumbdev(Rajgad), Torana, Kondana (Sinhagad) and Purandar and laid the foundation of "Hindavi Swarajya" - self rule. Toward the end of his career, he had a control of 360 forts to secure his growing kingdom. Shivaji himself constructed about 15-20 totally new forts (including key sea forts like Sindhudurg), but he also rebuilt or repaired many other forts to create a chain of 300 or more forts running over a thousand kilometres across the rugged Western Ghats. Each were placed under three officers of equal status lest a single traitor be bribed/tempted to deliver it to the enemy. The officers (Sabnis, Havladar, Sarnobhat) acted jointly and provided mutual checks and balance.